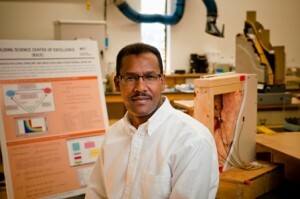 A paper published by BCIT’s Dr. Fitsum Tariku, director of the Building Science Centre of Excellence, has received the Best Paper Award for 2011 from Building Simulation: An International Journal. The paper, entitled “Determination of indoor humidity profile using a whole-building hygrothermal model,” published in Volume 4 Issue 1 of the journal, was selected based on the nominations from the journal’s Editorial Board and the recommendation of an Award Selection Committee comprised of distinguished scholars from around the world. Receiving the Best Paper Award represents the highest distinction and recognition of a published work among all papers published in Building Simulation journal for the whole year.